Among your generations of photo snapshots, do you also have those extra-special family heirlooms that are fading away, torn or need a major make-over? 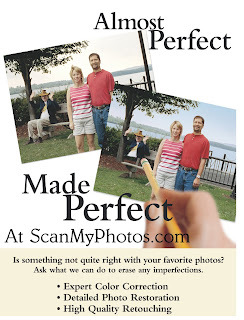 ScanMyPhotos.com and its photo restoration experts do magic. Awhile back, USA Today's Jefferson Graham, visited with us and had ScanMyPhotos.com digitally restore a photo that meant the world to his wife. She shared such a powerful story about why this tattered and torn photo needed to come back to life. All restoration stories are equally as emotional a nd the reason why the photo imaging business is so enjoyable and important. For more info on ScanMyPhotos.com and the Photo Restoration services, click here. Click here to view more ScanMyPhotos.com photo restoration samples. Let us restore and enhance your vintage photographs into works of art to be enjoyed and preserved for generations. Old pictures fade and degrade with time. 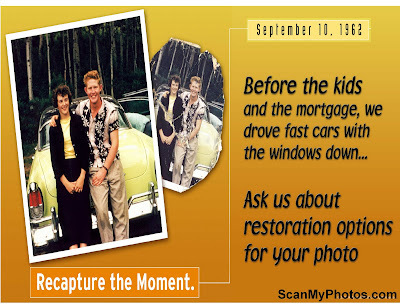 Fix old and damaged photos with our custom professional Kodak-quality photo restoration today from 30 Minute Photo Etc. 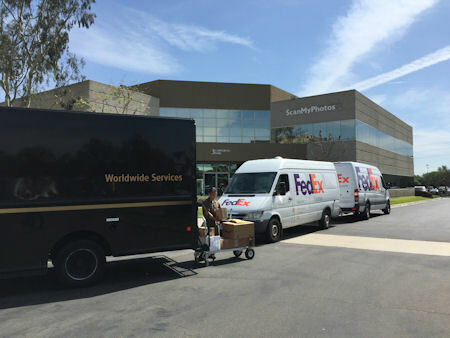 Since 1990, our customers have trusted us with all their photographic and now digital imaging services. You are about to find out why. Any photo restoration is now only $39.95, with a 20-day turnaround. Faster turn-around times available at an additional cost (see below). Additional print sizes on Kodak photo paper are available. Add tax for CA residents only (7.75%). All major credit cards accepted. Due to the custom nature of this work, no discounts, online gift certificates, or promo codes are valid for any restoration work. See a few samples of before and after.